Wolfee Technologies a development team based in San Francisco California has unveiled a new next-generation computer interface called Wolfee which has been designed to provide a healthiest most comfortable interface for both desktop and mobile computers. Watch the video below to learn more about Wolfee and its features which can be used as a desktop, from a couch or even when mobile without applying any stress to your hand or arm muscles even during extended periods of use, say it’s creators. The development team behind Wolfee explain more about its inspiration and design. 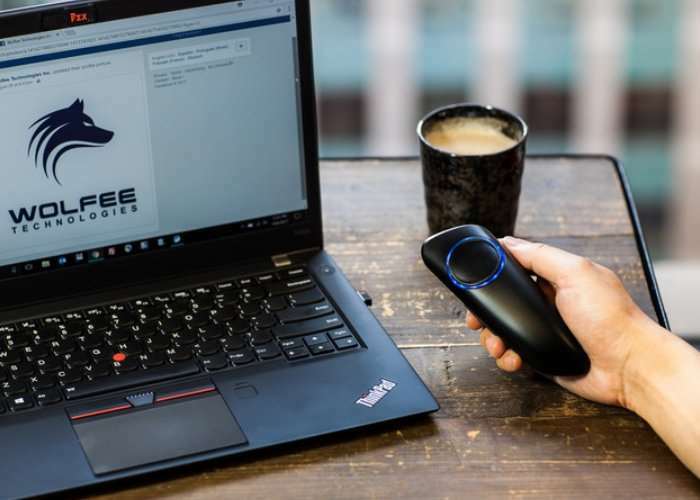 Wolfee is a wireless control that allows you to perform almost all computing tasks from your most comfortable seat in the room, while resting your fingers, wrist, elbow, and shoulder naturally without stressing any muscle. Wolfee provides the healthiest, and most comfortable interfacing technology to the market. It helps prevent users from suffering health problems such as eyesight deterioration, wrist, neck and back pain, which are often caused by extensive usage of cell phones, and/or the traditional computer mouse and keyboard. Moreover, Wolfee can control assorted computing devices with intuitively designed commands, offering users a unified solution to communicate with these devices. This is in sharp contrast to the reality where users often have to switch between different methods to interact with them. Wolfee is a wireless hand-held Human Computer Interfacing (HCI) device. Via Bluetooth, Wolfee remotely connects to computers, laptops, smart phones, or tablets, allowing you to perform almost all computing tasks from your most comfortable seat in the room. Wolfee is ergonomically designed to best fit the shape of a human hand. Your fingers, wrist, elbow, and shoulder can rest naturally without stressing any muscle, in contrary to a traditional setting with a desk, a mouse, and a keyboard. Wolfee is now available to back via Kickstarter with early bird pledges starting from $89 and delivery expected to take place during May 2018. For full specifications and more information jump over to the official Kickstarter campaign page via the link below.